Texas Trampoline offers this trampoline anchor kit to secure your trampoline firmly to the ground and keep strong winds from picking it up or flipping it over. It comes with 4 heavy duty augers that twist into the ground. Sturdy straps secure to each auger and attach to the frame of the trampoline. When properly installed, the trampoline legs will be divided into 4 equal sections to evenly distribute the tension and safely secure your trampoline and safety enclosure to the ground. 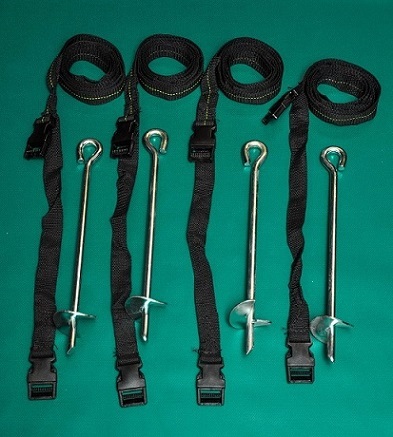 Protect your investment with a trampoline anchor kit. PLEASE NOTE: NOT GUARANTEED TO HOLD AGAINST ALL POSSIBLE WINDS! Damage to the trampoline or trampoline net due to high winds is not covered under this Limited 90 Day Warranty. PLEASE NOTE: NOT GUARANTEED TO HOLD AGAINST ALL POSSIBLE WINDS!